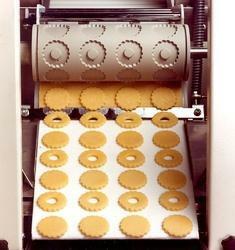 Leveraging on our team, we have been able to bring forth an exemplary range of Biscuit Rotary Moulding Machine. These presented products are precisely fabricated utilizing premium quality basic material, procured from the established vendors of the markets. Furthermore, in order to cater to the divergent demands of the clients, we offer these products in different sizes and specifications. Owing to changing and diverse needs of customers, we are engaged in providing a large range of Rotary Molding Machine. To provide various shapes to the biscuits, this Rotary Molding Machine is used in bakery and many more industries. Besides these, the Rotary Molding Machine we offer is known for their high performance. We are ranked amongst the most trusted firms deeply engaged in offering a wide range of Industrial Rotary Moulding Machine. 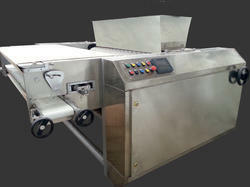 The Rotary Moulder is used to make Soft Dough Cookies and biscuits. Stainless Steel parts are used for contact parts, covers, hoppers and trays to maintain hygienic conditions. The Rotary Moulding Machine is used to make Soft Dough Cookies and sweet variety of biscuits like Glucose, Butter Bite etc. Stainless Steel parts are used for contact parts, covers, hoppers and trays to maintain hygienic conditions. Combination unit capable of doing both - hard dough Rotary Cut biscuits as well as soft dough Rotary Moulded cookies within the same machine.